Imagine you’re playing in the Super Bowl. Would you rather have the encouragement of an enthusiastic cheerleader or the guidance of a skilled coach? The field of Israel education is crowded with cheerleaders. Believing that it is their responsibility to champion Israel, teachers and parents aim to instill in young children positive feelings toward the Jewish state, in the hope that they will be protected from bad press and negative feelings about Israel as they grow older. The only problem: It’s not a winning strategy. We know this because, as educational researchers, we have been following a group of Jewish children in Los Angeles for the past four years to better understand how they think and feel about Israel. These children, who come from a range of denominational and ethnic Jewish backgrounds, began speaking with us when they were five, and we have watched them develop into confident and engaged nine-year-olds. We have found that, although many Jewish educators and parents want children to feel proud of Israel, most children’s perceptions are not wholly positive. In fact, the older children become, the more they voice conflicted emotions about Israel. By the ages of seven or eight, most children’s thinking about Israel has begun to reflect nuance and a sense of ambivalence. They say things such as, “Israel makes me feel happy and also very sad” or “When I think about Israel, I feel a mixture of proud and anxious.” We have learned from the children that when they give tzedakah to Israeli causes, and when they pray for Israel’s safety, they come to care about Israel, but they also intuit from a very young age that Israelis face serious challenges. As their emotional range grows, the children begin to carry the weight of sadness, fear and anxiety for the Jewish state. We can respond to this reality as cheerleaders or as coaches. Cheerleaders enthusiastically support the Jewish state. They model how to marvel over Israel’s technological advances. 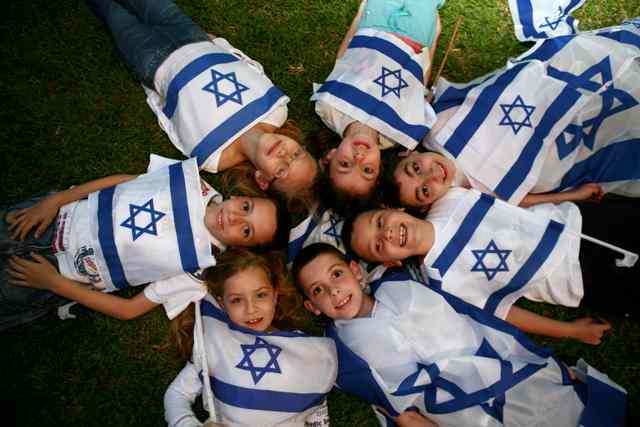 They express awe at the very existence of a modern Jewish country and encourage children to do so as well. In good times and bad, the default position of the cheerleader is to champion Israel. Yet cheerleaders offer, and provide space for, only a part of children’s reactions. For even very young children are thinking about — and worrying about — the challenges that Israel faces, and not only its accomplishments. Feelings such as sadness, fear and anxiety cannot be cheered away. Children must be given space to feel, explore and work through these emotions — and that’s why coaching is essential. Coaches, like cheerleaders, are encouraging, supportive and passionate, but they are also guides, helping their protégés to manage unforeseen challenges. They certainly champion Israel’s strengths, but they also understand that to struggle with Israel’s imperfections, and to invest in its improvement, is embedded in the very meaning of the word Yisrael (literally “wrestles with God”). For coaches, struggle is a sign not of defeat, but of commitment and growth. How might a cheerleader and a coach approach teaching the Jewish prayer for the State of Israel? Both may view the prayer, and the country whose protection it requests, as important, but they frame it differently. A cheerleader promotes the idea that Israel is, in the words of the prayer, “the first flowering of our redemption.” A coach, on the other hand, always keeps in mind that there is more than one way to run a play. The coach propels children to tackle the question: Is “the first flowering of our redemption” a description of reality or an aspiration? By encouraging active engagement and by making room for a range of emotional and intellectual responses, the coach creates space for every child on the team, whatever their position. If Jewish-American children are to develop a deep and lasting relationship with Israel, they will need more coaching. If they have access only to cheerleaders, they may disengage altogether. This is all too common among American Jewish teenagers, who do not see room in their schools and communities to grapple with complex or conflicted emotions about Israel. But if Jewish-American youth are coached through their emotional journey, no matter where its peaks and valleys may lead, they may yet emerge with new skills that enable them to struggle — and grow — with Yisrael. Our research has shown that even young children are capable of tackling the big questions of contemporary Judaism: What does it mean to be Jewish? What responsibility do Jews have to each other and to the world? What role does Israel play in Jewish life? If children are to create their own Jewish lives, honoring the Judaism of their progenitors while seeking their own paths, they will need encouragement and room to grow. It’s our job to coach them through the process — not just stand on the sidelines and cheer for Israel. Sivan Zakai is assistant professor of education at American Jewish University (AJU) and an affiliated scholar of the Jack, Joseph and Morton Mandel Center for Studies in Jewish Education at Brandeis University. She directs the AJU Teaching Israel Fellowship and the Children’s Learning About Israel Project (Brandeis). Hannah Tobin Cohen is a Teaching Israel Fellow and a research assistant in the Children’s Learning About Israel Project.